The impression I've always gotten from cozy mystery book cover illustrations are either a) tacky, or b) cutesy. By Book Or By Crook just happens to have one that is actually quite cute. And also, I like lighthouses, so it works out. It's not the best book cover illustration in the world, but the setting is one I like, and so I chose it as a Cover Crush for this week. I honestly really think it's just really to do with the lighthouse. Now if the background were nighttime then this cover would be even more fantastic. At least that's what I feel, personally. 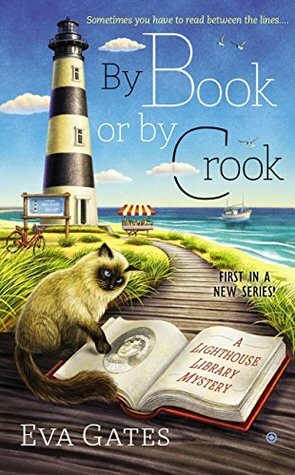 Here are the rest of the Lighthouse Library Mystery covers. I don't really like them quite as much, but they're cute too.